Rose pairs beautifully with chocolate, as the bitter edge of cocoa just cools the floral notes of the rose. Think of the best-tasting rose chocolates, from grand soft-centred choccie boxes through to bars of chocolate-covered Turkish delight. And, almost by chance, this recipe is gluten-free so even more of your friends can enjoy a piece. 1. Heat the oven to 180C (160C fan-forced) and butter the sides and base of a 20-centimetre square tin, ideally with a removable base. 2. Mix the butter, tahini, egg white, sugar, flour and sesame seeds together, then, using wet fingers, press this over the bottom of the tin. Bake for about 25 minutes or until just starting to colour on top. 3. For the Turkish delight layer, beat together the jam, flour and lemon juice in a saucepan, then add enough rosewater so the flavour is strong but not overpowering. Start with two teaspoons, then taste and adjust. 4. Bring the mixture to the boil, stirring all the time, until it becomes translucent and the starch is cooked through. Pour this on to the base, spread it evenly, then leave to cool, ideally overnight. 5. 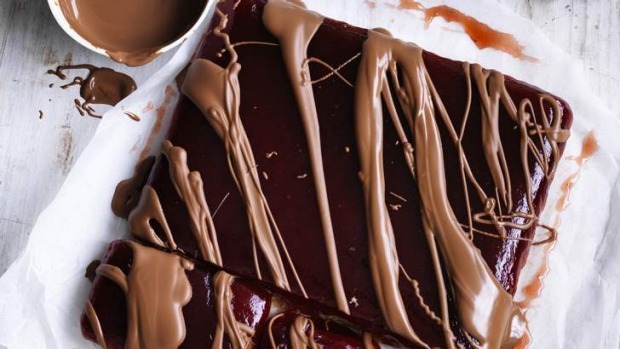 To serve, melt the chocolate and drizzle this over the top in swirls, then leave until set. Cut with a hot, sharp knife to serve.